Anyone trying to benchmark the banking industry with almost any metric immediately has to address the size issue. How real is the economy of scale argument? How much of an efficiency pick-up should a bank expect in a function that significantly grows its volumes? Does it always make a difference? Or, sometimes, should the same function at an $800 million bank, a $5 billion bank, and a $15 billion bank be performed with equal efficiency? Now, having just seen a picture of myself 20 years ago and one today, I’m trying really hard to get behind the idea that bigger is better and that mass has a positive effect. Sadly, I’m failing miserably. When looking at bank performance, however, the story is a bit more interesting. 1. The closer a function is to the bank’s customer, the less the economy of scale theory is true, because work increases relative to volumes. The farther the function is from customers, the more it’s true, because work does not increase relative to volumes. Let’s think about this. A branch customer brings a certain amount of support baggage – branch transactions to post, accounts to service, complaints to resolve, questions to answer. The fact that one bank or branch has 10 times the number of customers as another means it pretty much has 10 times the baggage (why wouldn’t it? ), and technology hasn’t helped (see #2). For the most part, work grows relative to volumes. This is backed up by our numbers – in every survey we have done, we look at transactions posted per teller per month, the number of new accounts opened by platform staff, and the number of consumer loans funded per FTE. We have benchmarked banks from $300 million to $30 billion. There is no relationship between bank size/volumes and these three ratios. Small and large banks both know how to staff a teller line for peak days/hours. They both know when calls increase in the call center. They both can do transactions in the same amount of time. On the other hand, let’s look at a group like deposit operations or loan operations, with little customer contact. Here, the story changes – volumes absolutely do translate to higher productivity. The effort to get the mandatory IRA distributions done for 50,000 IRAs is much less, relatively speaking, than for 5,000. The same can be said for, say, escrow analysis for 200,000 mortgages versus 10,000. There’s more work, for sure, but the work doesn’t grow relative to the volumes. Another example is regulatory reporting, which for a small bank is much more of an effort than for a large one, again relative to the number of accounts. And survey numbers bear this out. At banks that had 200,000 deposit accounts, each deposit ops employee supported 4,600 accounts. In banks with over 500,000 accounts, the number was 7,200. That’s a productivity jump of 60% for volume growth of 300%–400%. However, the back office function that deals directly with people (internal/external customers) the most – HR – is also the one that scales the least. In our last survey, banks with less that 500 FTE had 87 employees for each HR employee. Banks with over 2,000 FTE had 93. That’s a 6% pickup for 400% growth. 2. For the most part, technology does not increase the economy of scale opportunity, it decreases it. Guess what? Every one of these systems was deployed by smaller banks as fast as or faster than at larger ones. Truth be told, the smaller banks often got their hands around process improvements faster than their larger competitors. The result? These systems gave the same economies to smaller banks without them even needing the scale. Again, our surveys back this up. For example, credit unions with assets of under $500 million currently close more consumer loans per person than banks with over $2 billion in assets. 3. Often, efficiency improvements are not linear in the sense that every 10% increase in volumes will produce a corresponding 10% increase in productivity. Rather, there is a “plateau” effect in which getting to a certain “break point” size can result in significant productivity improvements. However, the opportunity will level off until getting to another significantly bigger size will again provide the second big productivity opportunity. Often, that is because a certain volume level is needed to make any group productive at all. This usually creates the first plateau. Call Centers – call centers in our studies had lower productivity (calls per agent) if they didn’t handle at least 15,000 calls per month. From 15,000–50,000 calls, productivity numbers were pretty equal. Somewhere over 50,000 calls, there was a jump in calls per agent. Branches – the minimum “break even” point for a branch to match the industry in teller/platform employee production is about $15 million in deposits. However, the next deposit size at which numbers tend to improve significantly is $75 million. The high performer that can take advantage of scale is in the back office somewhere. It’s less likely to be in the branches. The same peers can’t be used for comparison against all functions. The mortgage group may be at a different point of scale than the commercial group or the financial group. Asset size doesn’t necessarily point to equal scale opportunities by function. While it is difficult to negotiate where exactly the productivity “plateaus” are in a function, it is important for management not to lean too heavily on a pure linear notion of scaling. Smaller banks face a two-edged sword. In many areas, especially front-line delivery, they have the opportunity to use technology to take away the scale advantage of larger competitors. However, with that, the “they’re bigger” excuse goes away, too. Be careful what you ask for. The bottom line? There are economy of scale opportunities in banks. To get them, however, will take focus. The trick is knowing when and where the big ones are. Banks often shy away from benchmarking because they believe growth alone will address their earnings requirements. Institutions do need to grow, but it is how they grow that often separates the winners from the losers. 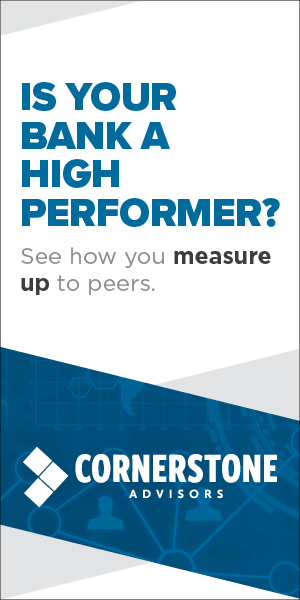 Cornerstone has developed a comprehensive two-step process – the Cornerstone Scorecard™ and our Best Practices Assessment – that provides an external snapshot of where your organization ranks vs. peers and industry leaders and then delivers pragmatic recommendations focused on reducing current operating expenses and improving productivity. Contact Cornerstone to get started on a roadmap to fundamental improvements and higher performance.